An electrochemical glucose biosensor was developed by immobilizing glucose oxidase (GOx) on a glass carbon electrode that was modified with molybdenum disulfide (MoS2) nanosheets that were decorated with gold nanoparticles (AuNPs). 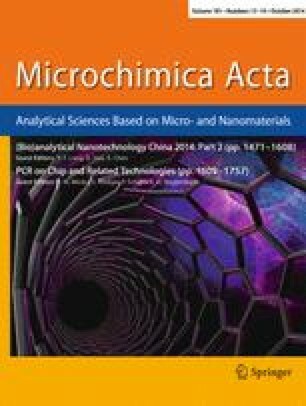 The electrochemical performance of the modified electrode was investigated by cyclic voltammetry, and it is found that use of the AuNPs-decorated MoS2 nanocomposite accelerates the electron transfer from electrode to the immobilized enzyme. This enables the direct electrochemistry of GOx without any electron mediator. The synergistic effect the MoS2 nanosheets and the AuNPs result in excellent electrocatalytic activity. Glucose can be detected in the concentration range from 10 to 300 μM, and down to levels as low as 2.8 μM. The biosensor also displays good reproducibility and long-term stability, suggesting that it represents a promising tool for biological assays. A MoS2-based glucose sensor has been prepared by gold nanoparticles-decorated MoS2 nanocomposite, which exhibited excellent electrocatalytic activity, reproducibility and long-term stability. It was applied to determine glucose concentration in human serum, suggest the sensor maybe promising for practical application. The online version of this article (doi: 10.1007/s00604-014-1178-9) contains supplementary material, which is available to authorized users. This work was financially supported by the National Basic Research Program of China (2012CB933301, 2009CB930600), the National Natural Science Foundation of China (21305070, 21204038, 81273409), the Ministry of Education of China (IRT1148, 20123223110007, 20133223120013), the Natural Science Foundation of Jiangsu Province (BK20130861), the Scientific Research Foundation of Nanjing University of Posts and Telecommunications (NY212033), the Priority Academic Program Development of Jiangsu Higher Education Institutions (PAPD), the Open Research Fund of State Key Laboratory of Bioelectronics, Southeast University.